Our team is investigating the Molidae through two complementary approachespop-off satellite archival tagging of individuals and genetic analysis of global populations. Our team has tagged Mola mola off San Diego (California), Capetown (South Africa), Kamogawa (Japan) and Queensland (Australia). We have also tagged Masturus lanceolatus off Hua Lien (Taiwan). To date, six tags have reported and we are in the midst of analyzing our data. Well be posting our exciting results soon so stay tuned. The sunfish have some dark secrets to divulge. 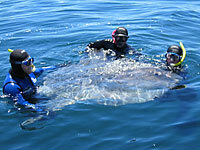 The mola team is also planning to tag more sunfish this July and August off the coast of California. And come December, theyll be heading to South Africa. Hundreds of tissue samples have been analyzed from mola populations spanning the globe. Some striking differences between certain populations are emerging. 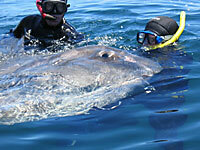 We may even have two new species of giant ocean sunfish. So stay tuned on the genetics front as well. While unpopular in Europe and the United States, molas are eaten throughout Asia. Taiwan and Japan are the largest markets. All parts of the mola are eaten including the skin, fin muscles, backbone, testes, and gut which is viewed as a delicacy. In Taiwan, the gut is served as "Dragon Intestines." Unlike their pufferfish relatives, e.g. Fugu, molas do not carry the deadly neurotoxin, tetratrodotoxin (Saito et al 1991). Mola mola is the most common bycatch of the drift net fishery, which targets broadbill swordfish of California and Oregon. According to reports from the National Marine Fisheries Society Southwest Region, between 1990-1998, 26.1% of the drift net catch consisted of the common mola, which translates to a catch of 26,503 individuals. 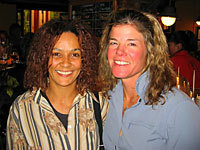 42.1% of the total discards were mola (Rand Rasmussen, pers comm). In the Spanish driftnet swordfish fishery on the Mediterranean side of the Gibraltar Straits, Mola mola constituted 71% of the entire catch in 1992, 93% in 1993 and 90% in 1994 (Silvani, L. et al, 1999). Until we establish baseline data on these fishes, we have no way of gauging how such capture rates are affecting the wild stock. 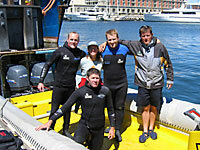 Tag team in the Capetown harbour with captain Gerhard Beukes far right. 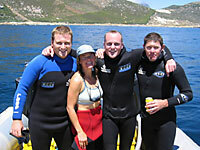 January was a great month for the mola team in South Africa! Working with the highly capable crew from Capetown’s Two Oceans Aquarium, we placed two more pop-off satellite archival tags on two sizeable molas (1.6 m in total length). The tag team included David Christie, Ed Hall, Anthony Lennox and Gerhard Beukes from Two Oceans and Tierney Thys from Sea Studios Foundation. August 23rd 2004 is when these tags are due to pop off and divulge where these African molas have been spending their time. Three years ago, Thys satellite tagged a Capetown mola with the help of her husband Brett Hobson of Nekton Technologies and Mike DeMaine, Zaid Manchest and Mike Farquhar-- from Two Oceans respectively. 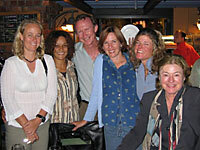 That mola traveled from Capetown up towards Madagascar between the months of January and August. Alas, that tag only communicated a couple times with the satellite before falling silent so we didn’t receive a robust data set. Fingers crossed we have better luck this year. During this trip, we also collected additional mola tissue samples with the help of Clare Taylor, Vince Calder, Brett Naysmith and Alan Waddell from Two Oceans Aquarium. Jan Wissema from the Capfish (Capricorn Fisheries Monitoring cc) observers program is going to help coordinate the collecting of more samples so we can finally have enough data to decipher if we truly do have a new species of Molidae! So stay tuned for more mola news.